Is fickle the right word? I don't know. Some days are good, and some are bad. Heck, some weeks and months are bad. And when things are bad, often they're really bad. My anxiety has gotten progressively worse over the past couple of years. Therapy is helpful, as are various meditation techniques. Still, the bad can be really, really bad. I heard an artist say that painting her experience of anxiety, panic, and depression was therapeutic for her. I know of another person who wrote music to express what he experienced. I thought that doing something like that might be good for me. The problem is, I don't paint. I don't draw. I don't write music. I gave up pretty quickly on the idea of expressing my anxiety artistically. But then, about a month ago, I was playing Shadi Torbey's excellent solitaire card game Onirim. In Onirim, you're working your way through dreams and occasionally encounter nightmares, which will destroy you slowly until you either die or barely win. The art in the game is stunning (Some people say "ugly." Those people are wrong), and the nightmare artwork does evoke the feeling of a nightmare. That's what I wanted to make. I wanted to make a game similar to Shadi Torbey's designs, which are all simple to learn, quick to play, solitaire games. Most importantly, however, they all give the player a high level of stress and tension. Torbey's games, to me, are all about the feeling they produce. I wanted to make a game that (somewhat) replicated the feeling of anxiety. Occasionally, things are okay; but often, things are absolutely overwhelming. Sometimes I'll feel at peace, and then all of a sudden, panic attack. I didn't want to make a game that explains anxiety. I just wanted to put the feeling that I experience from anxiety into a card game. The general idea for ANXIETY has basically remained intact from idea to final product. I originally envisioned a picture of a head on the table, with a greater and greater amount of darkness covering the head. I also wanted to express how anxiety tends to affect me differently depending on the day or hour. Both of these ideas quickly fused into one idea: there would be three tracks above the picture of the head. Each of these tracks would represent different symptoms of anxiety that I regularly experience. As these tracks filled, it would become darker and darker over the head. 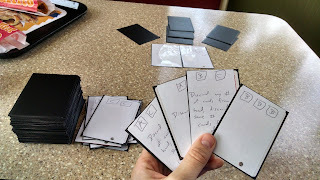 My original plan was to randomly scatter darkness cards throughout the deck of cards, similar to the way nightmare cards are shuffled into the deck of dream cards in Onirim. However, I wanted there to be a metric ton of darkness cards, as anxiety often feels all-encompassing. If I were to make that many darkness cards, the game would be relatively unbeatable, since there would be more bad cards than good cards. 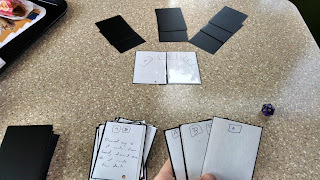 While I was sliding some of the makeshift cards into some black-backed card sleeves, I realized that I could make dark-backed cards, and the darkness could be represented by the backs of the cards instead of the fronts. A couple of pictures from the early prototype, with a Crisp Meat Burrito in the upper left. Crisp Meat Burritos do not come with the game. Each card, I realized, should have both bad stuff and good stuff (names weren't important at this stage). When the player draws a card, there would be two pieces of information: 1. what kinds of effects are causing harm to the player, and 2. a way to play the card and hopefully heal the player a little bit. Symbols representing "bad stuff" on the top, and "good stuff" for the player to do in the blue section. Deciding what the cards would do took a long time. I didn't go into designing the game with much of a plan. I simply mathed out how much and how often the 'bad stuff' would hit each of the tracks, and then I came up with as many interesting ideas as I could for what each card might do for the player. As I playtested the game, many of these cards changed (it was absolutely unbeatable for the first ten or so plays). However, the basic structure of the game hardly changed from this point. The player tries to rid the deck of cards, without letting their Panic Level reach 20. At the start of the turn, when the player draws a card, they first look at the bad stuff on the top of the card drawn. There will be a series of symbols that correspond to the three tracks on the game board. For each symbol on the card, the player takes a card off of the top of the deck, and places it face down on that symbols track above the game board. There are three tracks, representing sleeplessness, difficulty breathing, and intense worry/dread (each of these being responses to anxiety that I regularly experience). If there are ever three cards on one track, and the player needs to place a fourth, they DO NOT place the fourth card, and instead moves the Panic Level up one space. If it ever reaches space 20, game over. If the player gets all the way through the deck without reaching level 20, they win. After playtesting the game around 50 times or so, I mocked up some cards, and had them printed via DriveThruCards. They came out really great. The backs of the cards are no longer plain black, but have a lightning symbol on it. Why? The image just made me a little tense when I saw it, so it seemed to fit the theme. Also, the picture of a head ultimately became a brain. I only really made this game for myself. Somebody said to me while I was making it, "This could actually help people with anxiety." I'm guessing not. The process of making the game was therapeutic for me, but I don't know that playing the game would actually help anyone. In addition, the effects of anxiety in the game are ones that I've experienced, but anxiety affects people differently. So playing the game is probably not going to help someone else work through their anxiety, as they probably experience it differently. It is a fun game, though. Again, I made it only for myself, and never really intended to sell it, but as DriveThruCards is a print-on-demand service, and I already uploaded the files, it takes zero effort for me to actually make it available for purchase. So I did. If you want a copy, you can get one here. Hey! I run The Thoughtful Gamer and found this post really inspiring. I've talked before about my own struggles with depression and anxiety and how board gaming has helped with that. I bought a copy of your game and plan on reviewing it soon. I'd love to talk with you about the design. If you're interested, email me at marc[at]thethoughtfulgamer.com.